Today marks our first day of summer programs! FTE will be returning to Yale University this summer for not one but two sessions of Economics for Leaders. Yale University, located in New Haven CT, was founded in 1701 – making it the third oldest institution for higher education in the Nation. 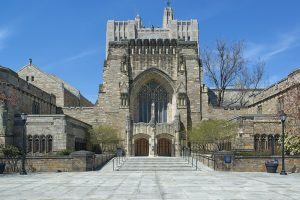 Since its opening, Yale has consistently been named one of the top universities in the country due to its highly regarded faculty and excellence in research. The Collegiate Gothic campus buildings make Yale one of the most beautiful and attractive campuses in the Nation. Yale set itself apart from other universities by becoming the first unive rsity in the United States to award a PhD, in 1861. Yale has produced a large number of notable alumni, including five U.S. Presidents and 19 U.S. Supreme Court Justices! Other notable alumni include numerous members of Congress, U.S. diplomats, 78 MacArthur Fellows and 247 Rhodes Scholars. Yale session one will be held from June 18 – June 24, 2018 and session two will run June 25 – July 1, 2018.